The 3-Position Director’s Chair with Ottoman™ folds flat and compact with its patent-pending SLIM-FOLD design. The chair folds 40% smaller than same-style director’s chairs and features a three-position backrest for ultimate comfort. The plastic side table has a built-in beverage holder. And for maximum relaxation, we’ve included an ottoman! When it’s time to pack up, simply fold the chair up using our patent-pending EAZY-FOLD™ Technology and carry it with its carry handle! The ottoman fits in a convenient side pocket on the chair, while maintaining a slim design. 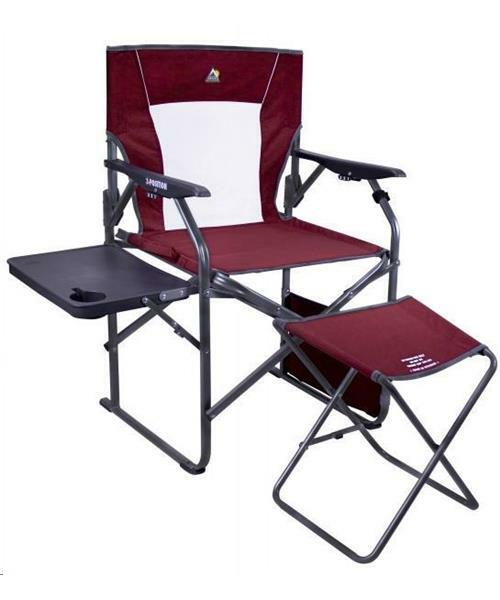 Ideal for camping, RV’ing, picnics and watching sports!